In the online development world, Node.js and PHP are some of the most popular platforms used. PHP was first released in 1995, followed later by Node.js in 2009, and they are both mainly used as a server-side scripting language for developing web-based applications. However, Node.js is also starting to be used as a desktop application development platform. In this article, we will take a look at the performance differences between these two platforms, some popular PHP extensions to improve performance, such as the Zend JIT runtime and HHVM PHP runtime project, and some third-party benchmarks of these extensions. One area where there has been a healthy competition of sorts between PHP and Node.js is in the area of performance. The standard PHP Zend runtime uses an interpreted compilation strategy, leading to less optimized code execution than a good JIT-(Just-in-Time)-based runtime. Several popular extensions have been developed — designed to improve PHP performance. Zend PHP 5.5+ also has a caching engine called OPcache, which stores precompiled script bytecode in shared memory, thereby removing the need for PHP to load and parse scripts on each request. This is not as performant as JIT compilation but is a stable feature that is working now. You can enable PHP 5.5 OPcache if for some reason it’s not enabled by default (as it should be with PHP 5.5 or higher). HHVM is an open-source virtual machine designed for running applications written in PHP and/or the Hack language. To make the most of the HHVM JIT compilation, it is important to put your code into functions, especially for the more time-consuming code parts. There has been discussion and development to use JIT compliation in a future release of the PHP Zend runtime. JIT for PHP provides more than five times speedup on bench.php and as high as a 30 times improvement on some other specific benchmarks like Mandelbrot. Node.js and PHP differ in their approach to concurrency, with Node.js using a non-blocking event loop (running in a single process) and the standard PHP Zend runtime using a blocking process. For this reason, multiple PHP processess are often launched from the web server to be able to keep serving web requests. In Apache, you can set the maximum number of PHP processess allowed to run, and this works fine for many types of web applications. Now, when the work being done in these processess tends to be long(er)-running, the server can quickly run out of available PHP processess. This will cause the HTTP request response times to increase, perhaps even to the point of requests timing out. Web servers like Apache and NGINX have ways to improve the PHP multi-tasking performance to some extent, but these are more limited than true language support for multi-tasking. There are several projects being worked on to make PHP asynchronous processing (multi-tasking) work better. The most popular is the HHVM project released in 2014 by Facebook; another project tackling PHP concurrency is pthreads. So what might these PHP extensions bring us in terms of performance compared to standard PHP or Node.js? Let’s have a look at a few different benchmarks people have done. Click on the image to go to the benchmark website and see the full setup details. This HTTP-controlled “hello world” benchmark used Zend PHP 5.6.6 with OPcache enabled. The test was done using the Apache ab benchmarking tool. 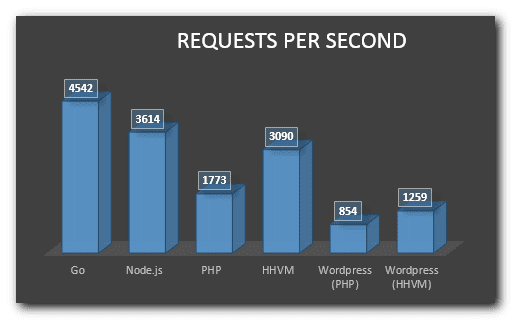 The performance of Zend PHP is less than half of Node.js. The performance of HHVM is about 74% better than Zend PHP. The performance of HHVM is very close to Node.js, but Node.js is still about 17% faster. The performance increase when using WordPress with HHVM is about 47%. This HTTP bubble-sort-job benchmark used Zend PHP 5.5.7 with OPcache enabled. The PHP response times degrade rapidly after depleting the available PHP process pool (using a standard maximum of 250 processes on the web server). The HHVM performance is similar to Node.js up to 1,000 sort elements, but with 10,000 sort elements, Node.js was about twice as fast HHVM (not visible on this chart). The following CombSort sorting benchmark is a strict CPU test. HHVM is seven times faster than plain PHP (by system time), but Node.js is more than five times faster than HHVM in this number-crunching test. In terms of RAM usage, HHVM is much more efficient than PHP, but Node.js is even better. 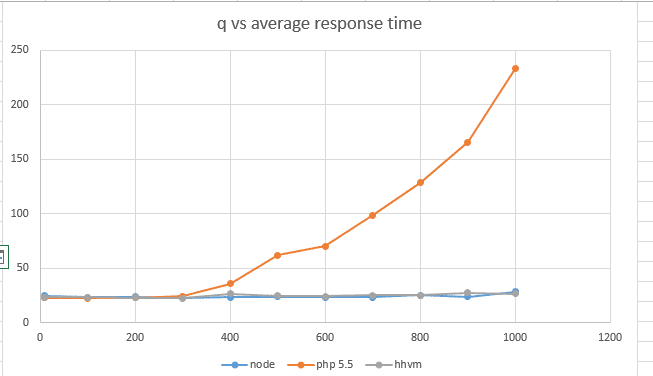 For most PHP applications, HHVM clearly provides a significant performance boost thanks to the JIT compilation. The same will likely be true when the Zend runtime JIT feature is stable and released. How much the PHP JIT compilation improves upon the non-JIT PHP is also a matter of code organzation (especially the time-consuming code parts). At best, HHVM is on par with Node.js, but in some cases, Node.js will clearly perform much better (e.g., for CPU-bound tasks). There are also more async code modules available for Node.js. There is ongoing discussion about the future of the Zend and HHVM PHP runtimes. HHVM also looks to be getting even faster by using LLVM later this year. Questions or Comments? Ask Roberto! Ask a question and Roberto will respond to you. We strive to provide the best advice on the net and we are here to help you in any way we can.